Kitchen floor, but not for long. 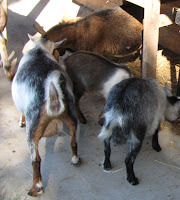 Goats have to be kept clean and the barn area free from waste that becomes disease infestations. 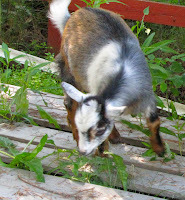 Because goats are pretty tough and relatively independent in many ways, folks often think that regular cleaning of the pen area is not necessary. Not true. You cannot take the short cut and allow your goats to live in filth. I’m not going to list all of the health problems your goat can encounter from unclean conditions but one of the most common disease with goats is mastitis and can be prevented by keeping your goat living area clean. 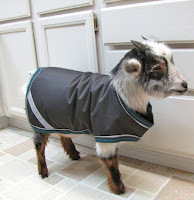 How do I keep the goat pen clean? 1. Be sure the floor of the pen is clean. Dirt is OK, rubber mats are great, I prefer wood. 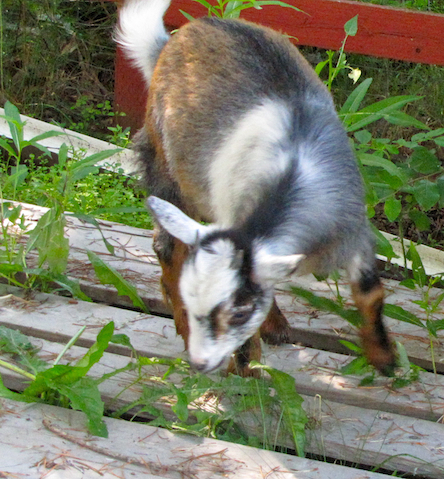 All of my goat sleeping/resting areas have 2x8 lumber flooring. Concrete, very easy to keep clean. 2. Use bedding in the sleeping area. Pine shavings or straw both work well. I prefer shavings because it seems to be easier to remove than straw once it becomes soiled. 3. Bedding should be completely removed once/week. I mix this with horse manure to make an excellent compost. Do you clean it once a week in the winter too?? and what about the pastures? I do try to clean every Saturday.